Right on the heart of the Art Deco District (Collins and 12th. Ave.). Only steps away from Lummus Park, the Versace Mansion, The Marlin, Victor and Tides hotels. The famous Osteria Del Teatro restaurant is less than 20 steps from our front door. 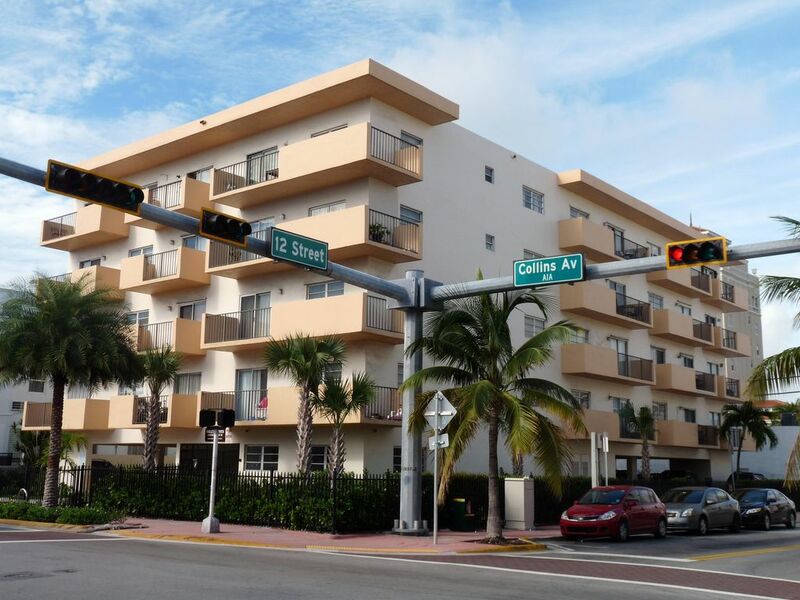 Within walking distance to Ocean Drive restaurants, Washington Ave night clubs and bars and the famous Lincoln Rd., Española Way, Jackie Gleason and Colony Theaters. This beautiful 2 bedrooms, 2 baths condo is located in a family oriented five story building with only 24 units. Perfect for families with children. Fully furnished, it can accommodate up to 4 Adults and 2 children. There is a child chair and a play yard that can be used as a crib. Convenience stores, as well as supermarkets are nearby. Enjoy the city, the beach and the nightlife without sacrificing comfort and convenience. Pets are NOT allowed and smoking on balcony only PLEASE. Activities and Attractions: World famous South Beach Miami. Jet Skiing and Parasail rentals at the beach. Fishing, golf, tennis, beach volleyball, roller blading and other sports in nearby parks. Excellent dinning, shopping and nightlife practically in your own backyard. You will be dealing directly with the owner. No agents, no realtors. Usually we are at the property to greet all our guests upon arrival and at departure time. Our home is only one hour North West from South Beach. We can be at the property in a matter of minutes in the event of an emergency. This condo is our second home. It is located on a small family oriented building. Most residents are owners that live there permanently or seasonally. The building is very safe and you will not find tourist’s transit. We as well as our family go there for vacations. You will be staying at our home!! The property is just 3 minutes walk to the beach. The best restaurants in South Beach are just within walking distance as well as the Lincoln Rd. Mall. Collins Ave is packed with the best name boutiques. Bikes and public transportation just a block away. No need of a car to access to all the best entertainment of South Beach. Smart HD television with access to internet. This two bedroom condo was tastefully decorated, fully equipped with anything you might need (placemats, wine glasses, nice dishes) for cooking , and the perfectly located in the heart of all the action in South Beach. The owner was a pleasure to deal with--always responsive to emails, helpful with suggestions and directions on how to leave South Beach via I-195 to reduce traffic, and a wonderful photographer (see her pictures adorning the walls). As an added bonus the owner also provided toilet paper, paper towels, and tissues often lacking elsewhere along with extra amenities like hair dryers and a make up mirror. The condo located on the fourth floor of a five story building has an elevator and is secured by both a locked gate and a locked lobby. We totally enjoyed the condo which has a view of the ocean when standing on the balcony and is a short 1 block walk to Ocean Blvd and all the action at the beachfront. Definitely avail yourself of the secured parking space as parking is at a premium in South Beach. We will definitely stay here again. It was a real pleasure meeting you both. It is always very nice to host appreciative and respectful guests that take excellent care of the property. We will love to see you again visiting South Beach, and, of course, staying with us. Wonderful hosts, great location, beautiful apartment. Wifi needs help, otherwise a perfect place. It was a pleasure to have you as a guest. WiFi should be working perfect by now. I’m sorry about the inconvenience you encountered with the internet, but it was something out of our control. Godfried A.Where do you live? Very pleasant stay for our family of 4, right in the heart of south beach. Will try to stay there again if the next opportunity arises. The well equipped kitchen was a nice bonus! I’m glad you enjoyed your stay; you and your family will always be welcome back. The apartment was perfectly located near the beach, activities, shops and restaurants. We were able to walk to everything. The condo was very clean and well appointed. Coordinating the booking, arrival and departure with Barbara was simple and fast. We had a great stay. It was a real pleasure to meet you and Regina. Hope to see you again in the future, our doors will always be open for you both. Rates based on one week minimum stay. This condo is fully furniture and can be rented for a minimum of 7 nights. Optional parking in the building parking garage $100.00 per week. Free Wireless Internet . Tax, Cable TV, Local phone calls and utilities are included. Long-term rental available at a lower rate.